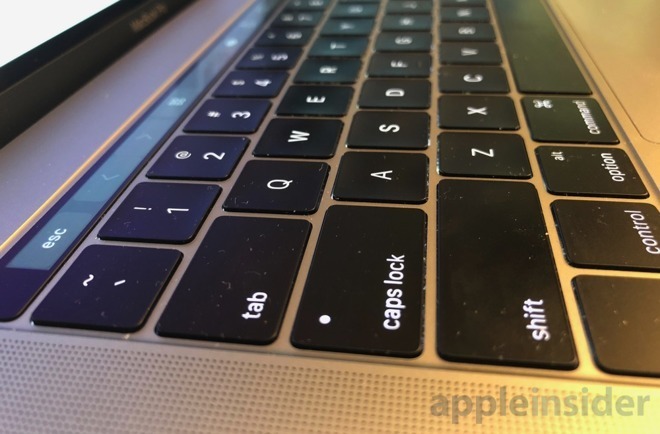 With Apple's launch of the repair extension program for the MacBook plus 2016 and 2017 MacBook Pro keyboards comes uncertainty about how to start it, and what to expect. AppleInsider explains the process, and tells you what you should do before you send your machine away for service. First of all, the repair program announced late on Friday is not a proactive one. Apple won't allow you to come in for a checkup for your MacBook, or 2016 or 2016 MacBook Pro or give you an advance replacement. It is only for machines actively experiencing issues. But, should your machine be manifesting symptoms like repeating keys or keys that don't register on press, starting the process is simple. If you're afflicted by the problems, contact AppleCare, or make an appointment at your local Apple Store's Genius Bar. While you're waiting, make sure that you have a backup, because the repair will not be done while you wait and your data is not guaranteed. If you even find an Apple Store that will do it on the premises, it is still a long process, basically involving taking the back panel off, and completely stripping the computer down to get to the upper case —which will be replaced in its entirety. We trust Apple's technicians, but we still suggest that after you have the backup, you wipe the machine of your data. Things can happen, machines can get lost in the process, so better safe than sorry. We also suggest you take a series of pictures of your machine before you hand it over or send it away for the same reason —accidents can and do happen. If you're not within range of an Apple Store, Apple will mail you a box to send your computer in for repair. While they do use FedEx overnight shipping for both getting the box to you and getting it back in to the service depot, this may add a day or two to the process depending on how late in the day you start the process. Regarding the four years timeframe: the time starts on the first day of the purchase from Apple or an authorized vendor. If you bought a MacBook or MacBook Pro refurbished by Apple, then the four-year counter starts on that day, not when any previous owner may have purchased it. Sources inside Apple's device repair chain have told us that as of Monday, they were still quoting and seeing between three and five days turnaround time if the machine is brought in to an Apple store, and five to seven business days if shipped, exclusive of the shipping box arriving at the customer's location. But, as the repair program was only announced on Friday, it remains to be seen how long that short window will last. Much of it will depend on if people have been living with the problem until now, or have turned to an external keyboard to solve the problem in the short term. If there have been a lot of people "sitting" on the problem and waiting because it's an expensive fix, the repair extension might have a surge in the short-term. We'll keep an eye on it, and let you know if things change. For now, though, AppleInsider's advice is, if you have the problem, deal with it immediately. If you put it off for a week or two after the program was announced, you will likely be without the machine for longer than the estimates currently stand on this, the first business day after the program's announcement. While iPhone owners outnumber the Mac using population about 20 to 1, when the battery replacement program began at the tail-end of 2017, the time that it took to get a battery replaced quickly expanded to weeks. This repair situation with the keyboard is logistically a simpler situation for Apple, though, necessitating four different upper case models between all the Macs afflicted, as opposed to nine different batteries. Another possibility is a third-party Apple-authorized repair shop. They will likely do the repair on the premises, but will still probably need at least two days to do it, given how the Apple repair process works with core replacement return. The keyboard isn't replaceable by itself. The upper case assembly includes the keyboard, the battery, and the upper case metal surrounding the keyboard and Thunderbolt 3 ports. We've seen out-of-warranty pricing with labor and parts exceeding $700 for the job. 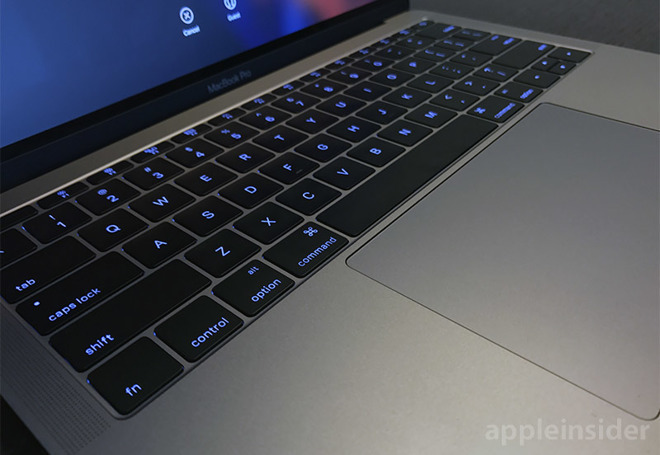 Exclusive AppleInsider research showed that the 2016 MacBook Pro keyboards were failing at a higher rate, as a percentage of service calls, than the 2015. However, it also showed that the 2016 model keyboards were failing at a higher rate than the 2017 model. Externally, the 2017 and 2016 keyboards differ in only one respect —the different markings on the option and control keys. It's not clear what, if any, changes Apple has made, but the differing rates suggest at least some. Since we published the original report, we have been told by more than one source that the 2017 keyboard is "better." However, we have not been able to get any elaboration on that in regards to what may or may not be different between the years. So, other than the four-year from initial purchase window acting as a de facto insurance against future failure, it's not at all clear that the problem is resolved for good after a repair.